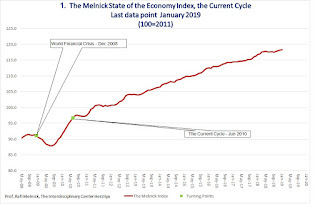 The Melnick State of the Israeli Economy Index increased by 0.2 percent in February 2019. The business sector growth continues. 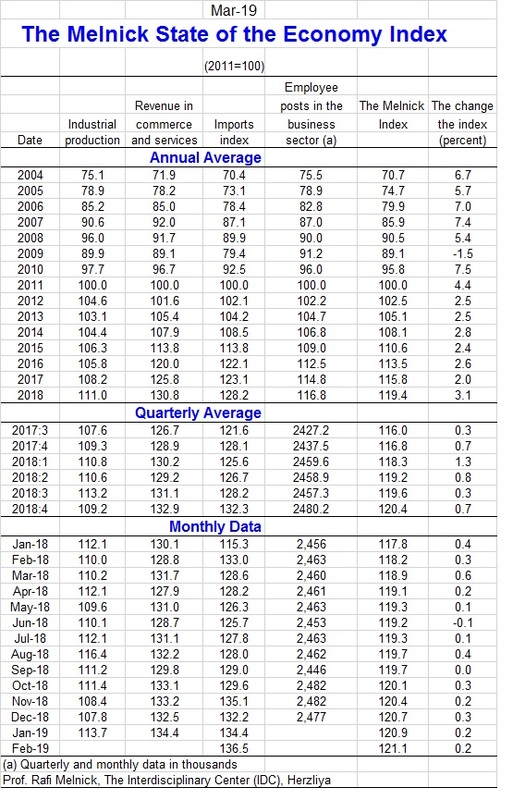 A significant revision of industrial production data conducted by the Central Bureau of Statistics (CBS) has improved the business sector's growth as reflected in the index of the state of the economy. 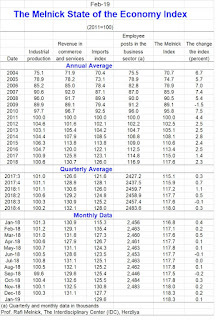 The revenue in trade and services, which reflects domestic demand, and mainly private consumption, rose again, reflecting improvement in domestic demand. The index of industrial production, which reflects the supply side of the business sector, rose by an exceptional 5.4 percent in January. It appears that this increase reflects, as mentioned above, mainly the updating of historical data by the CBS. At this stage, it is difficult to offer an economic interpretation. 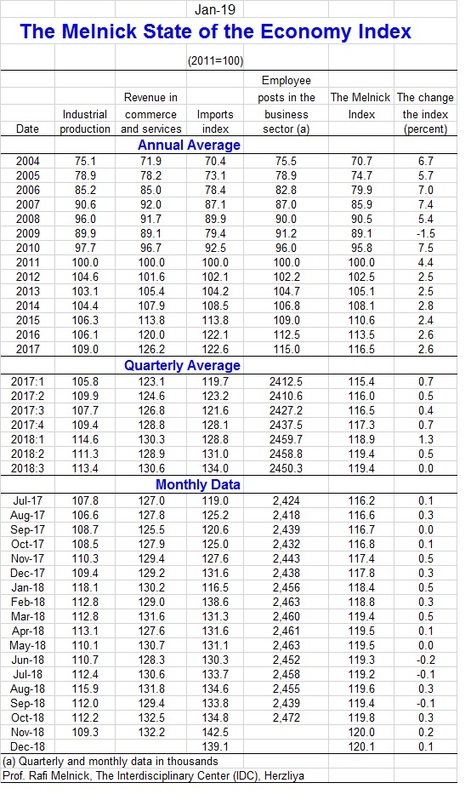 The rise in the imports index, which reflects mainly imports of domestic production inputs, indicates the possibility of continued growth in the business sector. 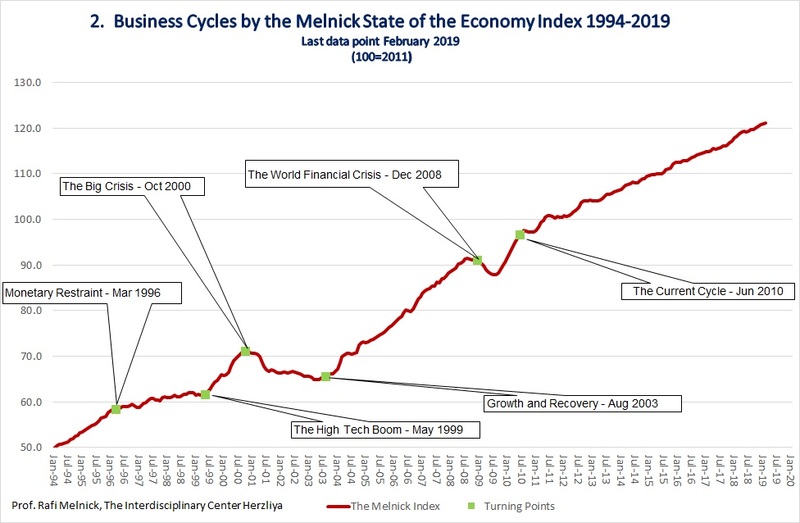 The number of employee posts in the business sector declined, but it is too early to interpret the decline as a turnaround in the labor market. 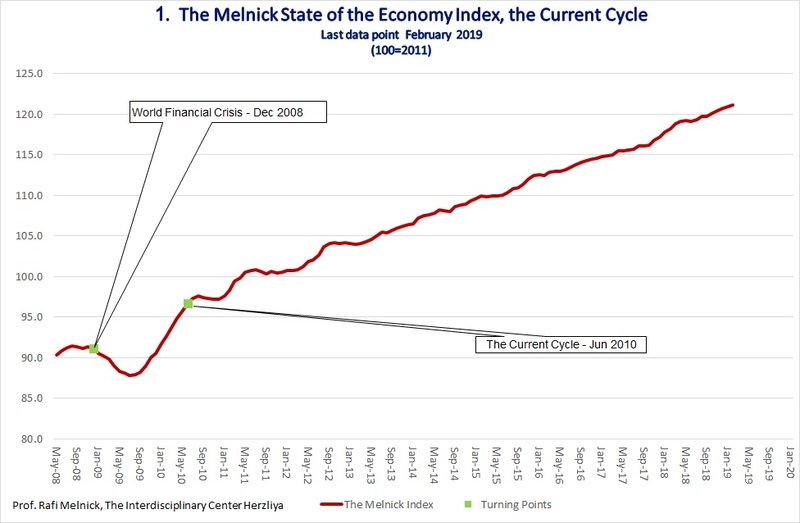 The February Melnick Index components include: an increase of 5.4% in the industrial production index in January, following a decrease of 0.5% in December; an increase of 1.4% in the revenue of commerce and services in January, following a decrease of 0.5% in December; an increase of 1.5% in the imports index in February, following an increase of 1.7% in January; and a decrease of 0.2% in the number of employee posts in the business sector in December, after no change in November. 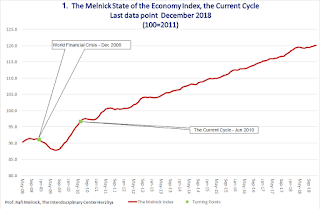 The Melnick State of the Israeli Economy Index rose by 2.3 percent in 2018, below the economy's growth potential. 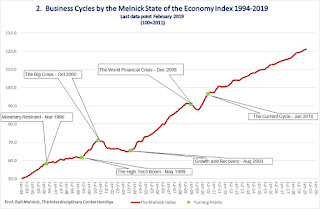 In January 2019, the index rose by 0.1 percent. Business sector growth continues at a moderate rate. The revenue in commerce and services, which reflects domestic demand and mainly private consumption, declined for two consecutive months. This development reflects a change in the composition of domestic demand. It can be determined that unlike in recent years, private consumption is not leading economic growth. 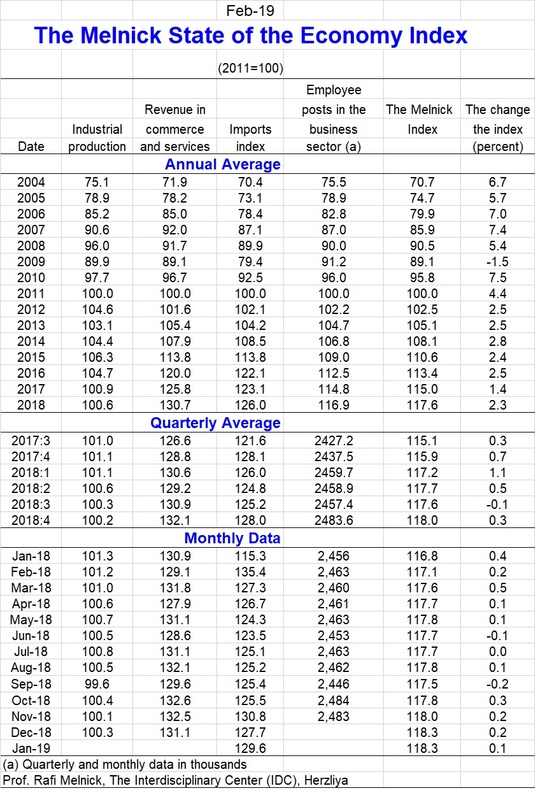 The industrial production index, which reflects the supply side of the business sector, is unable to increase and is apparently influenced by the slowdown in Europe, which makes it difficult for exports. The level of the imports index, which mainly reflects imports of inputs for domestic production, is high and does not constitute a constraint for the continued growth of the business sector. The number of employee positions in the business sector did not change, but the labor market continues to show resilience. 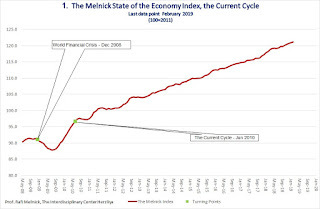 The January Melnick Index components include: an increase of 0.2% in the index of industrial production in December, after a decrease of 0.3% in November; a decrease of 1.1% in the revenue in commerce and services in December, following a decrease of 0.1% in November; an increase of 1.5% in the imports index in January, following a decrease of 2.3% in December. and no change in the number of employee posts in the business sector in November, following an increase of 1.5% in October. 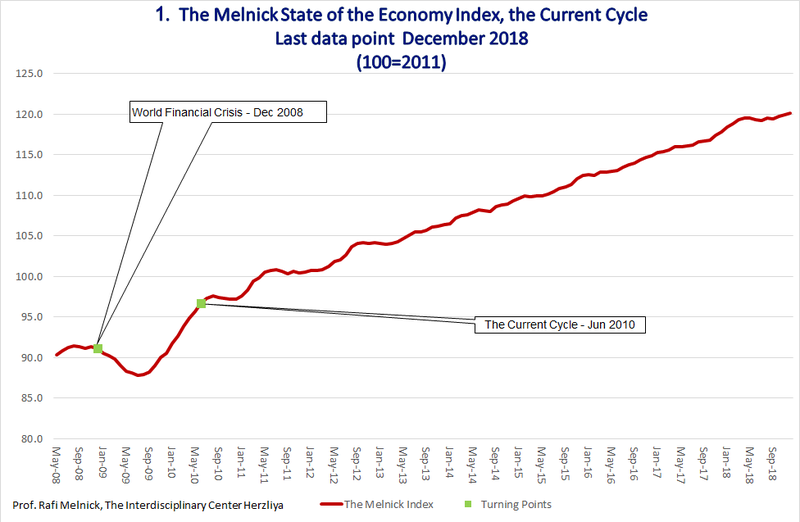 The Melnick State of the Israeli Economy Index increased by 0.1 percent in December 2018. The growth of the business sector continues at a moderate rate. The revenue in commerce and services, which reflects domestic demand and especially private consumption, maintains a relatively stable level. This development reflects the stability of domestic demand and especially private consumption. It should be noted that unlike in recent years, the impact of private consumption on economic growth has diminished. 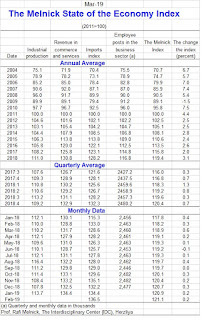 The index of industrial production, which reflects the supply side of the business sector, declined in the last month. Apparently, industrial production was affected by the slowdown in global markets, which is making it difficult for exports to develop. 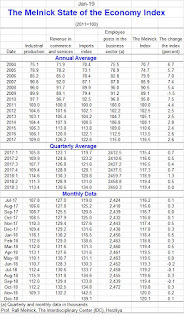 The import index, which reflects mainly the import of inputs for domestic production, also declined, but its level is still high and does not constitute a constraint on the continued growth of the business sector. The number of employee posts in the business sector increased reflecting resilience in the labor market. 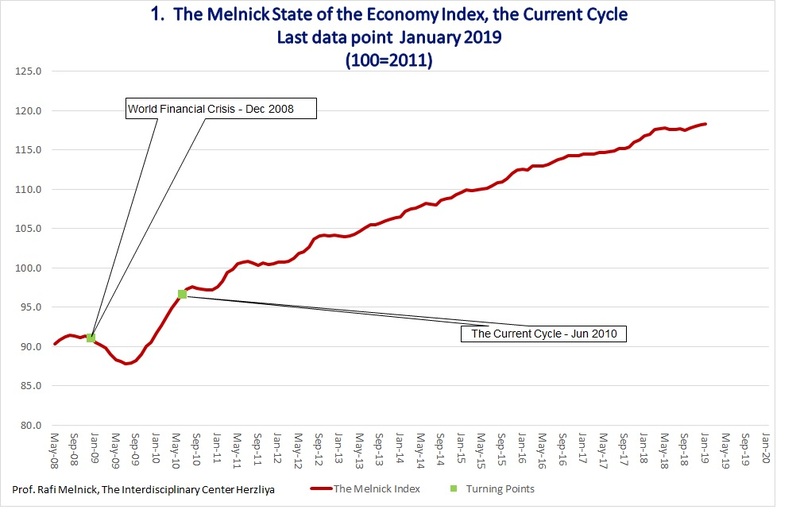 The December Melnick index components include: a 2.6% decrease in the industrial production index in November, following an increase of 0.2% in October; a decrease of 0.2% in revenue in commerce and services in November, following an increase of 2.3% in October; a decrease of 2.4% in the imports index in December, following an increase of 5.7% in November; and, an increase of 1.4% in the number of employee posts in the business sector in October, following a decrease of 0.6% in September. Ph.D. in Economics, University of California, Berkeley, 1979; B.A. in Economics and Statistics and M.A. studies in Economics, The Hebrew University of Jerusalem. Present - Professor at the School of Economics and at the Lauder School of Government at IDC Herzliya. Former Provost of IDC and member of the Monetary Committee of the Bank of Israel. In 1998 he joined IDC, served as Dean of the Lauder School of Government. Previously was Deputy Director of Research at the Bank of Israel, lecturer at the H.U. visiting professor at the universities of Boston and Davis. 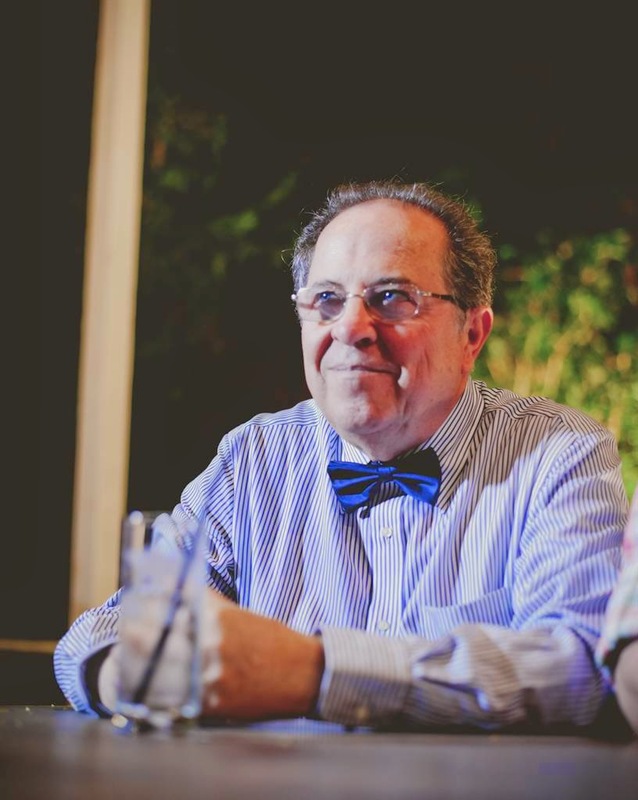 His publications are in the areas of monetary economics, the Israeli economy and Applied Econometrics. Former member of: the Advisory Committee of the Economic Council at the Prime Minister's Office, the Advisory Committee to the Minister of Finance, the Committee for Social and Economic Change and Chair of the Macroeconomic Forum of the director general of the Treasury. Was chairman of the investment committee of Migdal insurance company, consultant to Bank Leumi, member of the board of directors of Psagot-Ofek Securities and Investment Ltd., and associate at the Center for Social Policy Studies Research in Israel.